A long time ago, a teacher asked what animal I would like to be. After thinking for a while I told her that I would like to be a dragon. At that time I didn't know that my desire could come true. 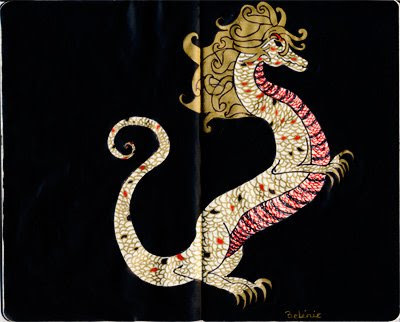 To my joy and surprise, my chinese zodiac symbol is the dragon. What a happy discovery. By the way, I forgot to add wings to this dragon. In another drawing I'll include them. Hace mucho tiempo, una maestra me preguntó ...Qué animal me gustaría ser?Después de pensarlo un rato respondí que me gustaría ser un dragón. En ese momento no sabía que mi deseo podr&iaacute; ser realidad. Para mi sorpresa y alegría, mi signo zodiacal chino es Dragón. Este ha sido un muy feliz descubrimiento. por cierto, se me olvidó ponerle alas a este dibujo. En otra illustración incluiré alas muy grandes. Thank you so much Ayse! !